satellites | Are We There Yet? From time to time when I stumble across something cool or unusual on the Web that I think is worth sharing, I will post a link here so you too can marvel or wonder or gasp or whatever it is you do to react. 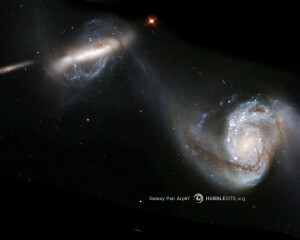 Check out this cool video on the Milky Way Galaxy. I love astronomy and the many mysteries of space, and missed my calling due to a major failing in being able to understand mathematics at a much younger age. But that never dampened my enjoyment of deep space discovery and finding out about the world, solar system, galaxy and universe that surrounds us. It is equally enjoyable to pass along this love of science to my two young boys. Just last week, we were having a campfire in the backyard (one of their favorite activities), sitting in our lawn chairs, heads bent skyward, looking for satellites. Most satellites go south to north in the sky, but we spotted a particularly bright object going west to east. I surmised (wrongly) that it could be the space shuttle as it was still awaiting word to land at that time. But a quick check on the Web told us it was in fact the International Space Station, ISS for short. We found a Web site, Live Real Time Satellite and Space Shuttle Tracking, that gives advance notice of when the ISS would be overhead in the coming days, so two days later, when the viewing was good, we were back outside and it appeared like clockwork. Nothing beats the wonder of a young child making the realization there are people up there, beyond the reach of gravity, traveling at thousands of miles per hour. Cool stuff.